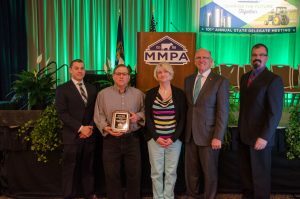 Koppenol Dairy Farm was honored by MMPA at the 101st Annual State Delegate Meeting on March 23 for producing the highest quality milk in the cooperative. From left: MMPA Member Representative Joe Packard, Alan and Deborah Koppenol, MMPA President Ken Nobis and MMPA Director of Member Services Dean Letter. LANSING, Mich.—Koppenol Dairy Farm of Coopersville, Michigan were named Michigan Milk Producers Association’s (MMPA) Top Quality Award Winners at MMPA’s annual meeting in Lansing on March 23, 2017. Alan and Deborah Koppenol run a 195-cow dairy that obtained the highest quality records in 2016 among the nearly 1,200 farms belonging to MMPA. To qualify, a producer must meet MMPA’s quality premium requirements for an entire year. The Koppenols stress prevention first over treatment to ensure the health of their herd and maintain high quality milk. They have always taken extreme personal pride in producing high quality milk. Since 1990, MMPA has recognized the farm that produces the highest quality milk for the year. “It takes commitment by everyone on the farm to meet MMPA’s quality premium levels every month of the year,” says Dean Letter, MMPA director of member services.